Warm Mediterranean flavours make this easy recipe a delight to eat. This quick dish is a perfect evening meal for family and friends. Preheat the oven to 200°C, gas mark 6. Remove the leaves from the lemon thyme sprigs and sprinkle over each cod loin, then lightly season. 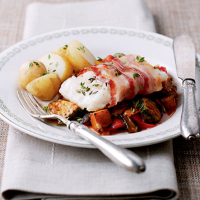 Wrap slices of pancetta around each cod loin so that the ends are underneath. Place in a non-stick roasting tin and drizzle with the lemon infused olive oil. Bake for 15 minutes, or until the fish is opaque and flakes easily. Meanwhile, make the ratatouille. Heat the olive oil and gently fry the crushed garlic for 1 minute to soften. Add the frozen vegetables and cook gently for 5-10 minutes. When the vegetables are beginning to soften, stir in the cherry tomatoes and tomato purée. Simmer gently for 5 minutes, then season to taste. Serve the cod on top of the ratatouille, garnished with the reserved lemon thyme and with lightly boiled, salad or Charlotte potatoes. Try other white fish instead of the cod, such as pollack, haddock or sea bass.